One the best high end, ultra premium cards in Canada got a makeover today. The Platinum Card from American Express has been a mainstay in many people's wallets thanks to its earning potential and travel benefits. It has been sometime since it last received a makeover and we are pleased to bring you the details of the newly updated Platinum Card. There are only two significant changes and everything else on the card remains the same - even the annual fee. Next it will earn 2 Points per dollar on travel spending - this should be global like the Gold Rewards Card and again it is a welcome increase. The remainder of the spending does unfortunately drop to 1 point per dollar. I do a lot of shopping on my Platinum card to earn the 1.25 points where other cards don't have category bonuses and I will now have to reevaluate that spending. I was told by American Express that they did lots of research and their numbers do show most spending on the Platinum Card is for dining and travel so for most people this should be a boon. Even you don't have other cards and get 1 point per dollar, when you average out with your other spending you will most likely still be getting 1.25 points per dollar or more. When you redeem Membership Rewards points for their great Use Point for Purchases Travel option this means you'll be getting a 3% return on Dining, 2% return on Travel and a 1% return on all other purchases. The points can also be used for the Membership Rewards Fixed Points for Travel option that works like traditional frequent flyer programs with set point amount for tickets. Now let's continue on the earn side - the 3 points per dollar is also like earning 3 Aeroplan Miles or 3 British Airways Avios per dollar since Membership Rewards points transfer to those programs 1:1! 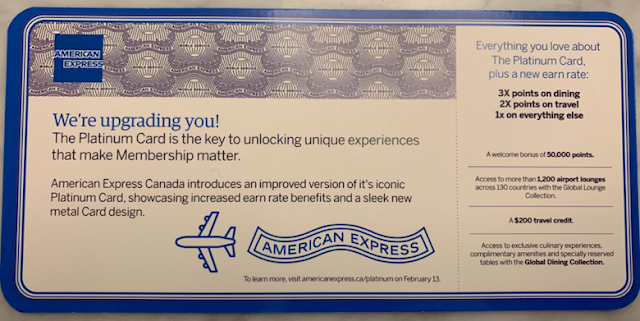 That's huge and remember Amex typically offers a bonus once per year for transferring to British Airways so that 3 per dollar could go as high as 3.75 or higher depending on the bonus! No other cards can get you that many Aeroplan Miles or Avios on dining spend. For the 2 points per dollar on travel, this is the same as the Gold Rewards Card which means you can earn 2 Aeroplan Miles or Avios on travel spending, once again the highest earn for all around travel for those programs in Canada. The second change to the card is strictly aesthetic but I know a lot of people have wanted this. And that is the Metal Card. Prevalent in the U.S., metal cards evoke even more prestige and people want it. 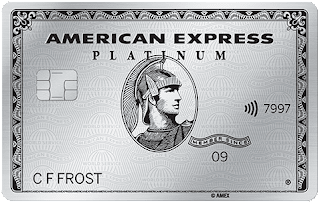 We've had many a reader ask us if Amex Canada was ever planning on bringing the metal card to our market and now they have done so. The great news about today's changes is that nothing else is changing on the card. The annual fee of $699 remains the same. Additional cards remain $175. The hotel and car rental elite statuses remain. The $200 annual travel credit? Still there. The insurance benefits remain and so on. The 50,000 points welcome bonus also goes unchanged. So for the most part, this is an enhancement to the Platinum Card and should make most of the current and future cardholders happy. I know we'll be keeping the Platinum Card in our family and keep using right beside our Gold Rewards Cards, Cobalt Cards and Starwood Preferred Guest Credit Card. Yes we have a lot of Amex cards in our wallets and some spending on them will be adjusted - depending on the reward travel we are looking for, dining may now be split between the Cobalt Card and Platinum card whereas prior to today it was all on the Cobalt Card. Really it all depends if we need a push for Aeroplan Miles or Avios or a boost to the Membership Rewards Select balance on the Cobalt card for some travel anywhere redemptions or to boost our Marriott Bonvoy balance. What about you? What do you think of the changes? Will this be enough for you to get the card now if you were unsure of it before? Will you keep it if you already have it and use it more now? Let us know!